Acadia Cyber Solutions LLC is a systems and services provider capable of delivering complete solutions for high-performance applications. Our portfolio of solutions includes: Enterprise Computing, Information Assurance, Program Management, and System Integration. Acadia has a strong working relationship with next-generation Internet test-beds such as those developed by the Department of Energy. Its facilities include resources for the design and integration of high-speed systems, including FPGA design tools, logic analyzers, protocol analyzers, and other high-speed test equipment. Acadia Cyber Solutions LLC focuses on creating the most secure information systems with emphasis on security analysis, measurements, and certifications. Our current system offerings includes security gateways incorporating high throughput encryption, AAA, and intrusion detection. Our development activities include custom off the shelf systems as well as custom hardware, firmware, software integrating for maximum performance. We are currently developing a 100 Gb/s eNIC Card with offload and SSL capabilities. 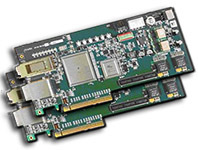 The development of this card will enable host systems to achieve 100G per port throughput for end-to-end data movement. With over 17 years of experience we offer a variety of services and solutions for high-speed networking and high performance computing (HPC).